"Watch TV? But Mom, I wanna read the Book of Mormon!" Make family scripture time productive. Get the kids excited. If kids can see how the Book of Mormon applies to them and if reading the Book is FUN, you might hear, "Is it time to read yet? ", rather than, "Do we have to?" We are counseled to SEARCH the scriptures, not just read them. It takes preparation to do that with children. This is the preparation that I've done. Now I have it for reference next time. And you do too. Comments welcome. Discussion: How did King Benjamin know about Lehi? Research: Why did the Nephites write in reformed Egyptian rather than Hebrew? 4:16-27 Are We not All Beggars? 8:13-17 What is a Seer? 12:27-33 "We Teach the Law of Moses"
I got tired of yelling at my kids, "Sit down and shutup!" during our daily study of The Book of Mormon. Don't we read The Book of Mormon in order to transcend that behavior? Putting myself in my children's shoes, I realized reading The Book of Mormon to them was like reading a discourse on molecular biology to me. The content is extremely important and applicable, but if I don't understand it, it means nothing. I wanted to find ways to bring The Book of Mormon down to the kids' level, and make it applicable and exciting to them. I've come up with discussion topics and activities to give The Book of Mormon meaning to my children. I pray that it will give The Book of Mormon meaning to your children as well. My goal is not to read every verse in the Book of Mormon nor is it to get through the Book quickly. Following this plan, it may take years to get through the Book of Mormon. My goal is to avoid the nightly battles. My goal is to have the kids look forward to studying the Book of Mormon. My goal is to help my children and myself understand the Book better and make its principles part of our lives. I could probably make some fairly elaborate activities from the Book of Mormon; elaborate costumes, games, projects, and so forth. But I prefer to keep it simple. Some of the activities require a little preparation, but these should only take a minute or two using items around the house. A whiteboard, markers, and an eraser are worth their weight in gold for family scripture study. Other than that, I don't recommend spending money for anything else. Improvise if necessary. I've tried to break the verses up into segments that will provide study, discussion, and activity that will last about 10 minutes per segment. If you have any other ideas to bring more excitement to family scripture reading, I welcome your comments! 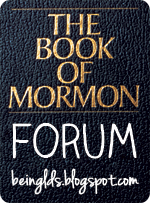 Member of Book of Mormon WebRing.